Lock in a great price for Grand Hyatt Baha Mar - rated 8.7 by recent guests. i like the hotel facilities and comfortable service. it's a wonderdul place for honeymoon and wedding. Great location and facilities! The employees are also friendly and helpful. The positives were the lovely room, helpful and friendly staff and an OK gym. Clean room with fairly cool fit out. View of sea, although most of resort in same view! The front desk lady who check me in she was real nice. I can remember her name but if you know who she is i need her to be notices please. Very good location, facilities, interaction with wild life (flamingos, sharks, etc). Beach is just in front of the the hotel, several points to get clean towels, sunscreen, etc. Nice location and garden. Staff are really helpful and friendly. In-room dining offers more than its restaurants. Clean , new , confortable , beautiful garden , swiming pools . Amazing! The staff mentality is to do everything so you enjoy your vacation. The property is gorgeous and has everything you need. One of our top picks in Nassau.Grand Hyatt Baha Mar, located in Nassau, offers 6 outdoor pools, a private beach area as well as a spa and wellness centre. Overlooking Cable Beach and the sparkling waters of Goodman Bay, this property also offers Free WiFi access. The accommodation will provide you with air conditioning and a minibar. 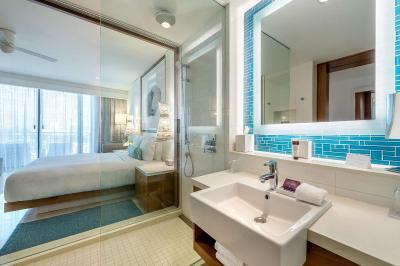 Featuring a bath or shower, private bathrooms also come with hairdryer and bathrobes. Extras include a desk, a safety deposit box and a laptop safe. 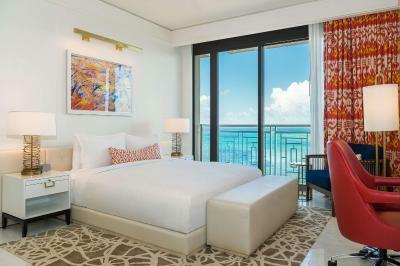 At Grand Hyatt Baha Mar you will find a variety of restaurants, bars and lounges, and also have the opportunity to experience a grand slam tennis at the Racquet Club with 9 tennis courts including clay, grass and Har-Tru. An array of activities can be enjoyed on site or in the surroundings, including shopping, golfing and gambling. This resort is 5 miles from Nassau International Airport. Grand Hyatt Baha Mar has been welcoming Booking.com guests since 13 Feb 2015. When would you like to stay at Grand Hyatt Baha Mar? This quadruple room features air conditioning, tea/coffee maker and tile/marble floor. Private parking is possible on site (reservation is not possible) and costs USD 16 per day. This double room has a tile/marble floor, satellite TV and tea/coffee maker. This quadruple room features a tea/coffee maker, cable TV and minibar. This double room has a bathrobe, minibar and sea view. This quadruple room features a minibar, tea/coffee maker and flat-screen TV. This double room has a sofa, minibar and satellite TV. This quadruple room features a tea/coffee maker, cable TV and bathrobe. This quadruple room features a balcony, tile/marble floor and satellite TV. This quadruple room features a balcony, air conditioning and minibar. This double room has a bathrobe, kitchen and microwave. This double room features a tumble dryer, washing machine and toaster. This double room features a minibar, tile/marble floor and tea/coffee maker. This quadruple room has a balcony, bathrobe and minibar. This suite has a minibar, dishwasher and toaster.